I’ve noticed a theme in many of the women I support as an executive coach. They’re the kind of women that if you were creating a high performing team, you’d want them on it! They tend to hold senior positions of responsibility. And they also have a strong sense of responsibility. They’re the woman that if you want to get something done, you go to them! They’ll get it done or they’ll take responsibility to make sure it happens. These qualities have seen them achieve great success in their lives. Their ability to take responsibility is a great strength. But when they overdo this strength it becomes a weakness. They can fall into the trap of feeling responsible for everything and everyone. They develop an exaggerated sense of responsibility. They fall into the trap of rescuing people, projects and situations. They jump in to fix things, even in situations when others are responsible. They often taken on more work. They feel obliged to help others even if it’s at a significant detriment to themselves. By fixing and saving others, a Rescuer believes others will appreciate and value them for their good deeds. Rescuers feel an obligation and urgency to change or fix, in their view, what is not going well. They often take on more work or duties, even when others are responsible or could do it themselves. They often attract others who seem incapable of helping themselves. They feel there is always someone in a crisis needing their help. Although on the surface taking responsibility seems like a good thing. It can be dangerous. 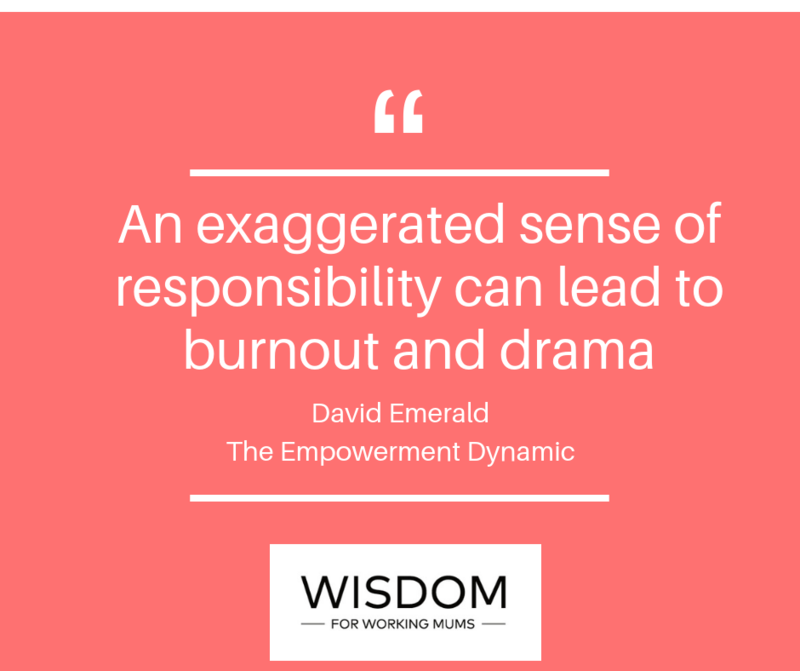 Having an exaggerated sense of responsibility is a recipe for overwhelm and burnout. It’s something that contributes to an unreasonable level of mother’s guilt. As often these women experience an unhealthy level of responsibility for the happiness of their children. If you can relate to this in anyway (I know I can because I used to be that woman) then it’s useful to know that you can’t free yourself from the burden of over responsibility until you can accept that you are only truly responsible for yourself. By doing this you strengthen others. As David Emerald explains, you transform others from being victims that need you to rescue them, to becoming creators who have their own appropriate level of responsibility and accountability. If you recognise yourself in anything I’ve said here then I invite you to reflect on your tendency to take responsibility. When is it helpful and when does it become unhelpful? What could you do to make sure you don’t over use this strength? If you need a nudge to help you to make some changes, it might be useful to remember that an exaggerated sense of responsibility leads to burnout and drama. And I hope you agree that none of us need that in our lives!